When I started using a camera almost 40 years ago, I was very much into Surrealism. Man Ray was one of my heroes. His pictures made me realize that photography is not limited to recording what you want to remember – after all, we have our heads to do that. So I tried to use photography for making the pictures I wanted to see. I still do. Rather than asking what I want to photograph, I try to figure out how to photograph things. When I photograph, real world objects are usually a means to an end, a pretext for playing with light and composition. In doing so, I feel I explore the ties between photography – alledgedly a realistic medium – and reality. As a photographer of miniature scenes I create a diegetic universe, a world ‘on the other side’ of the line that separates the world of the spectator from the world on stage. Doing so, I feel I am more closely related to film makers and fiction writers than to news reporters or product photographers. I do not make pictures of little toys or stage sets. Rather, I show rooms or whatever these stage sets represent. So I photograph something that’s real – toys, for example … but what reality? 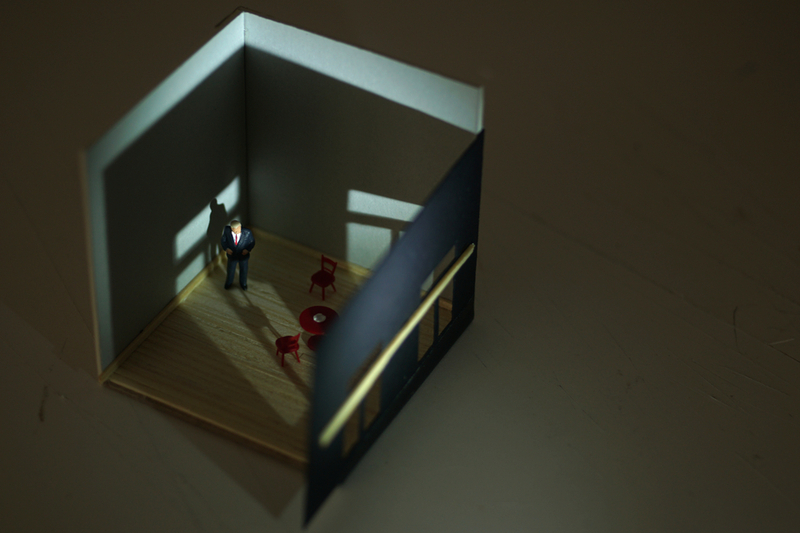 Instead of staging situations with models or actors, I use H0 scale figures. They appeal to me through the realism of their movements. However, their movements are already frozen in time. And their faces are (mildly put) quite abstract; mostly, there is not much to see here, hence no ‘portraits’. Their little flaws, together with the imperfections of my sets and the artificiality of the light, show that we are dealing with deception, or fiction. Like in much of my other photography (see my blog), there is some abstraction from the given world around us. gerade habe ich entdeckt, dass du deutsch sprichst 😀 großartig. Ich liebe deine Art zu fotografieren! Ich mag dein Spiel mit Licht und Schatten und manchmal muss ich richtig ins Bild eintauchen, um zu erkennen, worum es geht. Supersahnemäßig und sehr inspirierend. Sag mal, bist du auf Instagram zu finden? Ich vermute mal nein, denn finden konnte ich dich nicht.